As the use of technology advances, more and more people are sitting at desks and in front of computers or tablets for long hours. The amount we are expected to complete in a working day has gone up resulting in us sitting for 8-9 hours a day. Often arriving home too tired to do exercise and we get stuck in a circle. The weekend arrives, and many go mad with exercise, gardening or clearing out the loft. Then our backs hurt, we are convinced all the heavy lifting is the culprit. Often, it is everything leading up to that moment that has slowly over time created the damage. The heavy weekend is simple the straw that broke the camel’s back. Why sitting can affect our backs. Sitting can load our discs more than standing. 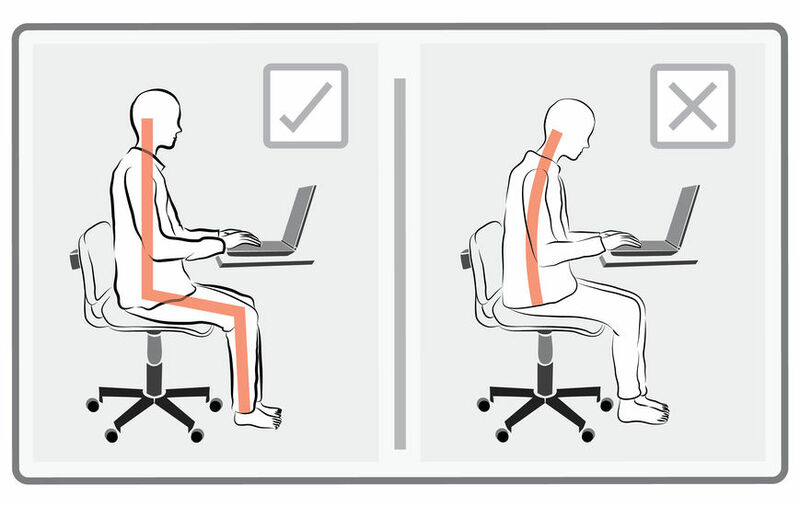 It is often because we do not sit with optimal posture. When sat with a straight back, hips and knees at 90 degrees of flexion and eyes horizontal 140% of the body weight is recorded between L3 and L4 (the lower back) When the seated subject leans forward, the pressure at this point is increased to 185 to 250% of body weight. Over time microtrauma can occur, resulting in damage to the disc structure and back pain. When you sit for many hours this microtrauma can build up. Certain muscles can also become inhibited so when you go to do heavy tasks or even be on your feet all day your back can be weak and not supported correctly. When you start to think of it logically and visualise what your day is doing to your body it makes more sense. Now, I understand that we can’t all do yoga on our lunch breaks or walk around in meeting rooms. However, there are plenty of smaller steps you can take to help your body. •	Do not stay in bed for longer than 8 hours, this includes reading before bed and when you first wake up. •	Avoid sitting for longer than 40- 60 minutes, standing for more than 1.5 hours if moving, 20 minutes on the same spot, unmoving. •	Adjust your seat in the car and get a lumbar support roll or cushion. •	Do not sit bolt upright without support, a chair should have a mild decline, so you aren’t leaning forward. •	Avoid wearing shoes that are very flat with little to no support, try extra insoles (Tesco do foam ones) or wear supported trainers as much as you can. Your feet and discs could do with the extra support. •	Staying hydrated is important for your health for many reasons but did you know it is also very important for your disc health, aim for 8 – 10 glasses of water a day, minimum. •	Look into the anti-inflammatory diet – a food list that helps your body manage a better and more natural response to inflammation. •	Try to avoid an uneven load. – i.e shopping bags on one side, shoulder bag or weights in one arm. •	Avoid leaning over for long periods of time. E.g doing dishes and brushing your teeth or putting things in the back of van or car. •	Try to avoid too many repetitive movements, bending or leaning over will aggravate your back. IF you must break jobs up into smaller sections and rest in between. •	Even if you feel stiff and locked up you must avoid being sedentary, even just a walk to the end of your road or some gentle stretches can stop you from seizing up further. I work with many patients who suffer with lower back pain. All symptoms should be diagnosed by a professional but many of the steps above can aid in recovery. Plenty of studies have shown how conservative care can be just as successful, if not more successful than surgery. It is very important to treat the cause and not the symptoms. This is why manual therapy can be so beneficial. After all I have had hundreds of patients with lower back issues, I can usually find out or ask the right questions that aid in leading us to the cause. As always, if you have any questions please do get in touch straight away.